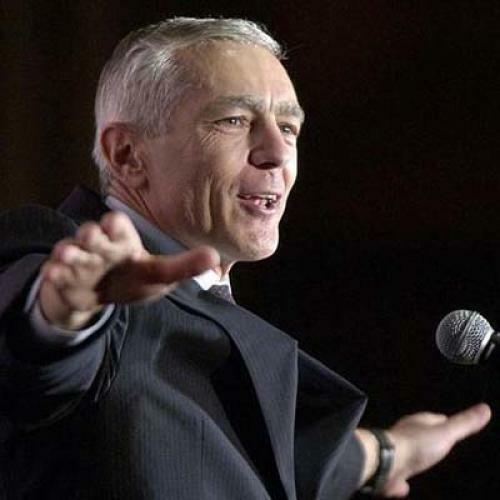 The strange journey of Wesley Clark. When the world last left Wesley Clark in early 2004, he was a streaking meteor of a presidential candidate. Still fresh from leading NATO in the Kosovo war, he arrived as a savior for the left, who saw a bulletproof patriot that the rest of America could believe in; hero of the netroots, beloved by Michael Moore and Madonna; hope of the Clintonites, delighted by such a clean ideological slate. Alas, after five blazing months, Clark for President flamed out. There are the conventional explanations: He got in too late. He didn't play in Iowa. Being the anti-Dean stopped working when Howard Dean himself collapsed. All are true--but, ultimately, Wesley Clark just wasn't a politician. "This was Michael Jordan playing baseball," a Democratic strategist told this magazine in 2004. "I think it's dawning on him that it's unlikely that he would end up being Secretary of Defense or Director of National Intelligence," a former aide mused, noting that he probably wasn't on any short lists to succeed Defense Secretary Robert Gates. "I don't think he would want a lesser job. I think his view is, not going to run for president again, not going to get one of the gigantic jobs he was interested in in the federal government, so might as well take a new course." Well, in February, Clark found one: front-man for the ethanol industry. When Wesley Clark bounds into the conference room at the nondescript D.C. office of Growth Energy, the industry coalition with which he's thrown in his lot, I am struck by his smallness--he hunches in his chair, his thinning hair carefully combed. An aide brought in a Coke and a Diet Coke and set them on the table. Clark chose the red can and cracked it open. "When I got out of the military, I didn't know what I was going to do," he said, after a ten-minute disquisition on his prescience about energy in the 1970s. "You never know. You know, General Omar Bradley, when he got out, they made him chairman of Bulova Watch Company. So, you never know what they're gonna offer you. And sometimes they don't offer you much." "Exactly," he replied. "I mean, it's just people out there. They say, ‘We know this general. He's a leader! Let's give him our company!' Nobody does that." So, after being relieved of his NATO post in 1999, Clark decided on three intermediate goals: become a university professor, improve his golf game, and make $40 million (he says he was inspired by George Soros' philanthropy). He began by signing up with an investment bank based in his hometown of Little Rock, to little effect--the head of the bank, a Bush stalwart, would say later that Clark hadn't brought in any deals. He wrote a book about his experience in the Balkans. He dropped all his corporate board memberships to run for office, and after that idea fizzled, he was back to square one. "I said I want to focus on something, what's it gonna be," Clark continued. "In the military, I had done a lot of R&D work. And I thought, maybe I can be a technology guy. I've done software programming, I really pushed for unmanned aerial vehicles, I talked about laser weapons. I thought, I can go and I can really work, you know, like these guys in Silicon Valley. But I discovered that at the time period I was at"--early 2005--"that wasn't a big thing. The IPO markets were basically shut down." When a group of investors in ethanol made from rice straw approached Clark in 2007, he was intrigued. "I said, ‘Oh, I remember ethanol, I mean, I campaigned in Iowa,' and they told me before I went to Iowa, you've got to like ethanol," he said. "So I'm not against it in principle, I mean, tell me about it." Clark tried selling the idea to his partners in his "little investment bank in New York"--Rodman & Renshaw, the full-service private equity firm that he joined after the campaign--but they weren't interested. Renewable energy deals were too much of a risk; the cash flow had dried up entirely. Then, in late 2008, Clark met Jeff Broin, CEO of Sioux Falls-based POET, the largest ethanol producer in the world (and Growth Energy's animating force). Clark, who is something of a techno-geek, visited one of Broin's research labs and was impressed by the scientists running around in white coats, working on the next generation of cellulosic biofuels. He asked Broin to bring him on board. "I'm happy to talk about ethanol, I'm a big believer in this thing, but I'm a businessman!" Clark exclaimed, pounding the table for emphasis. "I want to actually build things that hire people and change America, not just talk about it." Broin decided to give him a chance--the industry had image problems, and having a four-star general out singing its praises couldn't hurt matters. Ethanol is an odd cause for anyone not running for office. It's not that there's anything wrong with it, per se--it's just not a particularly good substitute for gasoline, either economically or environmentally. The industry is dependent on billions of dollars a year in federal subsidies; in 2007, ethanol producers received three times as much in tax credits as those companies generating energy from wind, solar, geothermal, and biodiesel combined. Taking into account the greenhouse gases produced over its entire lifecycle--through fertilizer, machinery, and transportation--corn ethanol is not a dramatic improvement over conventional gas, and may actually be dirtier if it takes up land that had been set aside as a carbon sink. American farmers have been switching from soybeans to grow corn for fuel, which causes more deforestation in places like the Brazilian Amazon as subsistence farmers cash in on higher soybean prices. And even cellulosic ethanol, which is better from a carbon standpoint, has yet to be produced on any kind of industrial scale. Clark used to speak compellingly about the dangers of global warming, but in his role as Growth Energy spokesperson, he hasn't spend much time on the environmental case for ethanol. He can't, really, because he also works for a Canadian-based petroleum company that is exploring shale gas in the United States--an energy- and water-intensive process that involves extracting gas from rock--and operates two massive oil fields in Albania. (The former Supreme Allied Commander's contacts in Eastern Europe have proven useful, a company representative told me.) What's more, Rodman & Renshaw's energy portfolio is composed exclusively of oil and gas--the company hasn't been able to attract capital for renewable projects. And he also consults for an oil refinery in Kansas that produces nitrogen fertilizer and operates a crude oil trucking business. Instead, Clark lingers on impassioned odes to the American farmer, and the evils of OPEC--his major talking point is how ethanol enhances U.S. energy security, reducing its need to import oil from abroad. (Although it should be noted that, if all of America's corn were distilled into fuel, we'd only displace a sixth of our gas consumption; better technology and conservation policies could do that with far less distortion of the market.) In service of Growth Energy, Clark has opposed some environmental measures, like California's proposed new low-carbon fuel standard, which takes a dim view of ethanol's carbon-reducing credential. All this makes it hard going, trying to mop the mud off ethanol's public face these days: Environmental groups are pretty much united against further subsidizing the corn industry, and insist that more research is needed before even allowing more ethanol into gas tanks. When it comes down to it, though, Growth Energy isn't really banking on Clark's public charm offensive to save its product. The group hired a team of professionals, experienced Washington hands with ties to important Democratic figures, to do the arm-twisting and staff-nagging. And they have--perhaps to a fault. Until recently, environmental groups like the Union of Concerned Scientists tolerated ethanol as a compromise fuel because it might create jobs and reduce oil imports. Now, such groups slam ethanol as a boondoggle pushed by corn companies--Jeff Broin's POET foremost among them--that hold the keys to reelection for many a farm-state politician. "Growth Energy has struck a very aggressive political approach on Capitol Hill and, I think, has only polarized the debate rather than helped it," says Nathanael Greene of the Natural Resources Defense Council. Clark, meanwhile, is trying to convince people that ethanol just got a bad rap. "I've always been someone who looks at the facts and looks at the directions, and I take hard positions that are sometimes unpopular," he says. "I did it successfully in the military… I did it when I ran for office. I was the first one to call for Rumsfeld's resignation and say that it was a mistake to have gone into Iraq. And, when you see things that are right, you act on it." *Correction: The original sentence implied that Clark's remark caused him to have no role at the Democratic National Convention in August 2008. In fact, no causal connection has been demonstrated.